Megan, Tanner, and Faithe proposed the niche market of goat meat to Meadows Ranch in 2005. The demand for goat meat, or chevon, in the United States is incredibly high. Much of the meat consumed worldwide is chevon. Goat meat is incredibly healthy due to its digestibility ease. We purchased 100 does who fell into our natural meat program. Our first couple years of goat meat production were challenging but now we are seeing the benefits on our pastures. 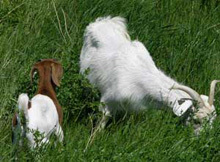 The semi-intensive grazing technique that is required for goat production provides each plot of land that has been grazed, time to rest and re-fertilize before it sees grazing stock again. The 200 does we graze today travel tightly as a group. This allows them to graze quickly on one area and move on, a benefit to the land. 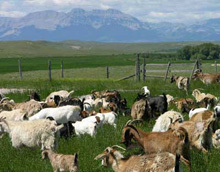 Our goal is to provide local stores with, and become your direct market for, Montana-raised, natural, grass-fed goat meat. Goat meat is currently being sold at Mountain Front Market in Choteau.